400 Israel Sci-Tech Schools students join with Israel Electric Corporation community outreach program. A joint project between Israel Sci-Tech Schools, Israel’s largest non-state network of comprehensive high schools, and the Israel Electric Corporation aimed at promoting leadership, quality of the environment and conservation of energy, has also become the hallmark of coexistence. Approved by the Education Ministry, the project was run in coordination with the Israel Air Force and with the participation of 400 students from 20 of the schools in the vast Israel Sci-Tech Schools network from the Upper Galilee to the Negev. At a ceremony held on Monday at the President’s Residence in Jerusalem, five of the most outstanding students who participated in the project shared details of what they had experienced and what they had learned. Most had known very little about electricity before embarking on the project and had never realized how important it is to switch off a light if it isn’t being used for a particular purpose. Raja Albuwab of Ramle Sci-Tech School was proud that his was the first Arab school to be included in the project. The students who made presentations were Jewish, Bedouin, Arab, and Druze along with the representative of a mixed bunch of youth at risk. Israel Sci-Tech Schools Network CEO Zvi Peleg said that the Network represents a microcosm of Israeli society – “Secular, religious, Jewish, Muslim, Christian, Arab, Bedouin, Druze…they are all our children,” he said. Established in 1949 as a series of vocational schools, the Israel Sci-Tech Schools Network not only grew in the number of its institutions and the size of its student population, which is well in excess of 100,000, but also in the quality and standards of its education. The curriculum enables students, especially those from peripheral communities, to reach their maximum potential in both low-tech and hi-tech. The aim today is to give every Israeli child equal opportunities to acquire a comprehensive education and to absorb the best values of society, said Peleg, citing some of the voluntary community service work undertaken on a regular basis by 25,000 Israel Sci-Tech Schools students. Included in their voluntary service is attention to the needs of senior citizens at 20 centers for Holocaust survivors. They also go abroad as young ambassadors for Israel. “Israel Sci-Tech Schools teaches the art of giving,” he said. IEC chairman Yiftah Ron Tal said that this was an entirely positive event. Vigorously enthusiastic about the project, Ron Tal said that it was conducted within the framework of the IEC’s community outreach program coupled with the desire to improve the quality of the environment, with cleaner pollution- free air. The IEC was also keen to reduce the gaps between young people in peripheral communities and those of their peer generation in the center of the country, he said. 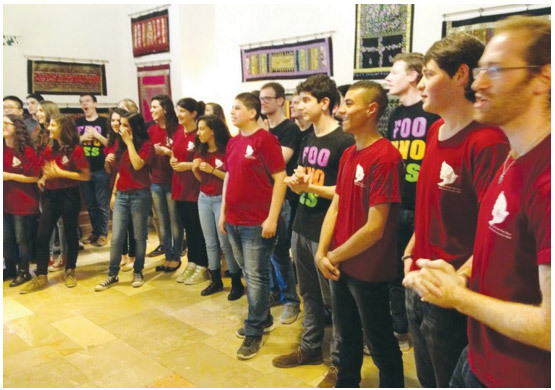 President Reuven Rivlin earned a spontaneous round of applause when, in appreciation of the talents of a nine-member male choir of Israel Sci-Tech Schools students, he leapt out of his seat and joined them on stage for the final chorus of their song. He was even more appreciative of their second song, the lyrics of which urged acceptance of the other, greater sensitivity toward those who are different, and a plea to give them a chance to be happy.